The U.K. has been on a mission to improve the health of its citizens this year; among many efforts is a caloric guideline of 400 calories for breakfast, and 600 calories for lunch and dinner. 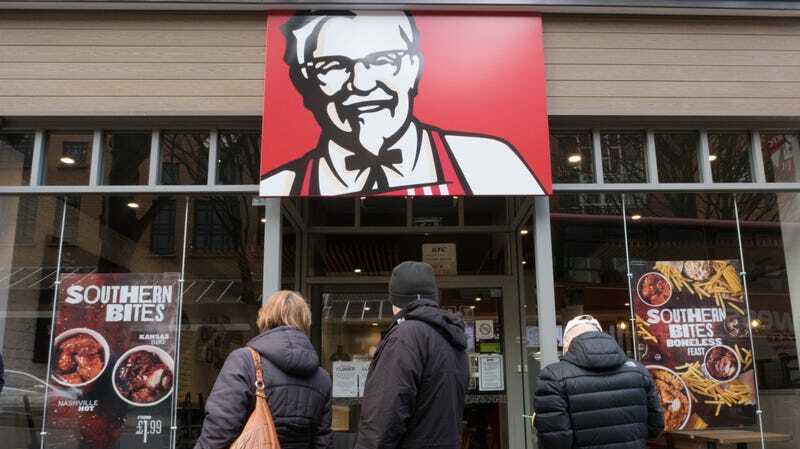 The Independent reports that fast food chain KFC will attempt to meet these stringent limits by reducing the calorie count of its menu by 20 percent per serving by 2025. Ahead of that goal, KFC says it will strive for an overall healthier menu by 2020, with more meals under 600 calories, adhering to Public Health England’s guidelines. Which leaves us a bit stumped as to what a healthier KFC would look like. Air-fried chicken? Smaller mashed potato bowls? The Independent points to possibilities like offering only sugar-free drinks, free healthy sides instead of fries, and a possible vegetarian option, which stumps us all over again. A veggie chicken sandwich? The Independent reports that the update “will not change the Colonel’s secret recipe of 11 herbs and spices.” Well, that’s a relief, although herbs and spices usually have very few calories.